Double good news today. The first good news is that we will be speaking about Gigatron at the upcoming Hackaday conference on May 26 in Belgrade. We’re super excited that our talk was accepted, and hopefully this event is a chance to meet with many of you. The second and even greater news is that our supplier has sorted out their delivery issue. We reported about that hiccup earlier this month. This means that now we’ve all parts in-house for a first batch of kits. 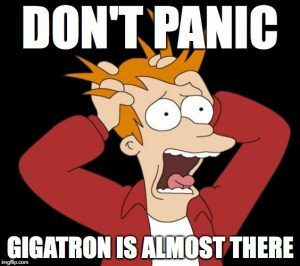 Gigatron is ready to ship, and we’re open to take orders! With ROM v1 done and arrival of the last kit parts confirmed for this week (yeah), now is the time for chores. The syntax I used for writing the apps has some rough ends. It was grown bottom-up, hand in hand with the GCL-to-vCPU compiler, while vCPU was still evolving. As I’ll need a new compiler for the Arduino interface anyway, why not fix what can be fixed? So now here is a formal EBNF definition of the updated notation, or call it a language if you wish. There is a great online visualizer that turns these grammars into easy-to-understand railroad diagrams. I’ve always liked these since studying the “Pascal User Manual and Report” in my first year at college. A webpage with all diagrams sits here on HaD. GCL will never look pretty, but it at least it isn’t Perl. Small hiccup, but almost there! 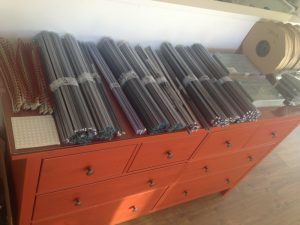 With great anticipation we received our last parts for the batch last week. Panic ensued when we discovered they were of the wrong type. Not a few, all of them… Did we place a wrong order? Frantic discussions with the supplier followed and yesterday it became clear: they messed up, apologised, and they are now sending us a new batch. We expect the total impact will be a two-week delay. Bummer, but at least we didn’t lose any money on a stupid mistake. 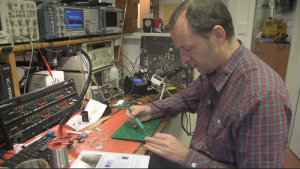 So please bear with us a little bit longer, soon you will be heating up your soldering iron! After 360 commits my coding frenzy has reached a conclusion: ROM v1 is feature complete! The kit will ship not with one but two fast paced games: Snake and Racer. Sound improved and the serial loader is reliable, which is great for hacking and making more games. The fractal program now doubles as a clock, to give a valid excuse for keeping a unit on permanent display in the living room. The unused ROM space is filled with three classic hires images from my previous projects. 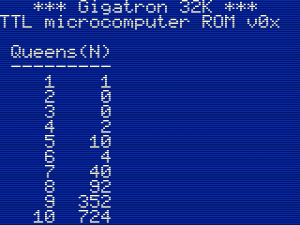 By packing 4 pixels in 3 bytes I got three images in where the ROM otherwise would only have space left for two. This doesn’t mean the to do list is empty, far from that: “make todo” lists 90 ideas I apparently still have in mind. But after 6 months of breadboard prototyping, 3 months of PCB design and 4 months of software hacking, this is a good point to shift focus again. For example, towards demonstrations, tutorials and documentation. Keep you posted. The assembly videos are now available on YouTube. 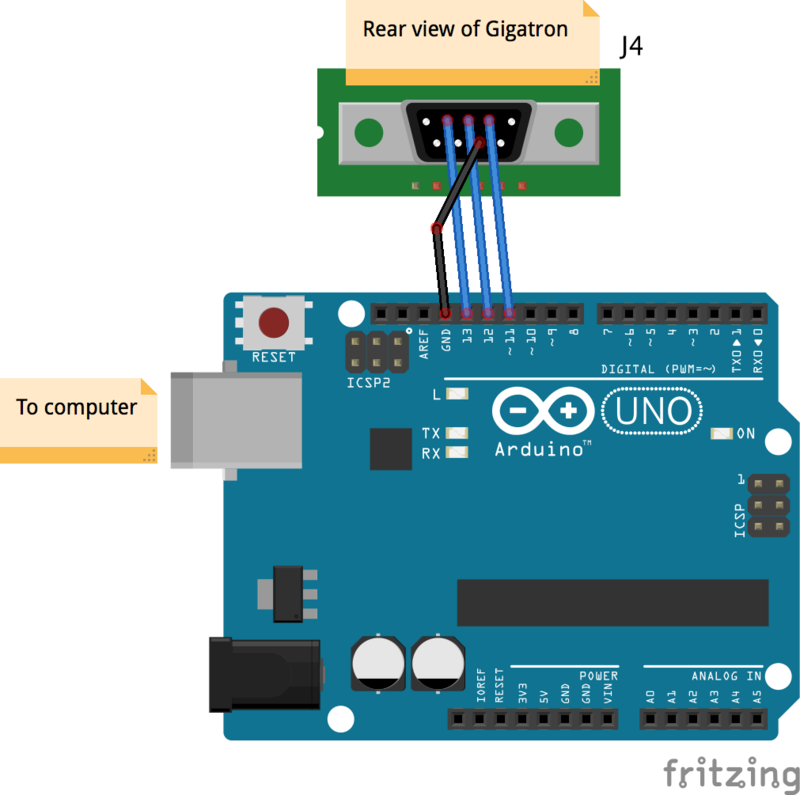 It is a series, in which I go through all the steps to build a Gigatron. These steps are also explained in detail in the assembly manual that comes with the kit. At the Hacker Hotel conference, I talked about the Gigatron and people were excited about it! We are excited too, as we are reaching the point where we can actually sell a batch of Gigatron kits. If you want to be informed, subscribe to our mailing list. While Marcel is busy with the software, meanwhile I am working on over an hour of video footage on how to build the Gigatron. 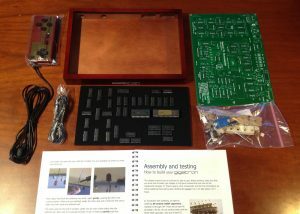 Actually, the 48-page assembly manual that is supplied with the kit already contains all that is needed to understand the electronic components and how to place them, how to solder and how to test the Gigatron during the build process, but we like to make this system as easy as possible to build. The software to be included with the kit release later this month is nearly done. Just in time as we’re now also waiting for the last parts shipment to arrive, expected in two weeks. When those are good we know if we can meet our target selling price and will announce it to those interested on the mailing list. All other parts are in house already, manuals printed, packaging ready and beta tests successfully completed. Our living rooms look like a warehouse now. Of course the kit will ship with some demo applications built-in. My focus is for a part still on those, but equally important is that the programming core is stable and tested. 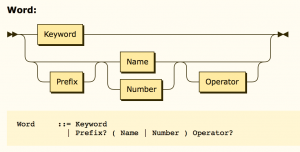 For me it is crucial that the memory map is well-defined and the 16-bit interpreter is fully tested and useful. After all, the vCPU opcodes are jump offsets, so it will be impossible to fix any of that later while maintaining compatibility as well. Last week I found I had some unused space in the interpreter code page, so I added some new bit-wise logic instructions and support stack variables. Surprisingly, none of the applications I wrote so far needed those. 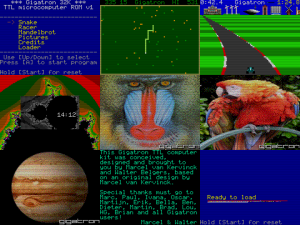 The loader was the last part of the software that needed debugging with a scope. 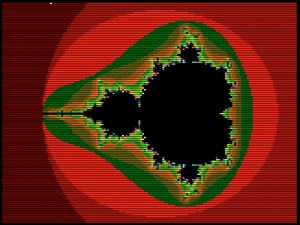 I got a bit stuck with the work I was planning for today, so I wrote something else to regain motivation: a fractal! Rendering takes a while, being fully interpreted and lacking multiplication, and even without the “right-shift” operation you badly need for this. All those must be mimicked with slow high-level code using just addition and subtraction. 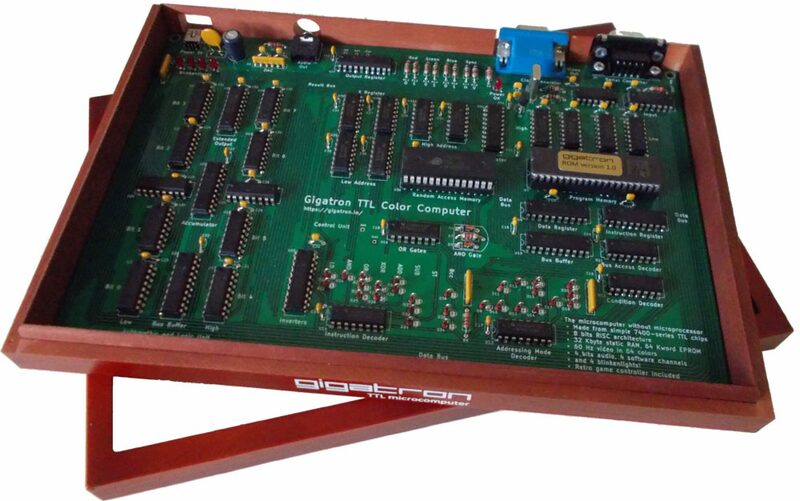 As I mentioned in the previous post, I did a talk about the Gigatron at the RevSpace hackerspace. One of the people there was Michai, who has a podcast called CBA podcast, about software, electronics and mechanics. He mentioned the talk in his latest podcast (from 6’41). Last friday, I gave another lecture about the Gigatron at a hackerspace, this time at Revspace. We got some really good feedback and it was very nice to talk to people that have been working on building their own processor or computer. The lecture was not recorded, but an earlier version of the talk, that was given a month ago at the Hack42 hackerspace, is. It is included here.